They sound like a dream! No more plugs, no more cables to get tangled into, no more hoping that your straighteners work when you’re on holiday but do cordless straighteners actually work as well as plug-in hair straighteners? Are they ever going to be as good and if so, which are the best to buy? We investigate all the important detail so you know you’re buying a quality product and whether or not it works! Why Should I Consider a Cordless Hair Straightener? How Do Portable Straighteners Compare to Regular Hair Straighteners? If you’re a frequent flyer or you regularly go off on important business meetings – or perhaps you want to pep up your hair to go straight from work to drinks, the cordless hair straightener could well become your very best friend. Completely portable and with today’s up-to-date technology, many are as good as the regular power cord straightener that you already know and love. More and more manufacturers are producing these rechargeable cordless straighteners and it’s not surprising, as we live in a world that is dominated by rechargeable technology. Portability which is useful for travel or for everyday. A variety of heat settings. Ionic technology (on some models). Ceramic or tourmaline materials (for good heat conduction). Different sizes for different hair lengths and textures. Of course, the big question is, how do they compare to regular straighteners? The truth is that if you look into different manufacturers’ models, you’re bound to find something that’s as good as a regular model. The only problem you’ll encounter is that they slow down as the rechargeable battery depletes so you do need to keep an eye on the level of charge. On the positive side, when it comes to travel, you don’t need to worry about voltage changes or speed of heat-up or even whether your straighteners will be able to meet the heat you require to straighten your hair. As these babies are completely cord-free and run on a battery, they don’t need that plug change. There’s also no chance of them blowing a fuse in your hotel bedroom – and when you have a frizzy hair day on the way to work, what better way to re-vamp your hair than in the office ladies’ toilets with your portable cordless straightener. Genius! The biggest disadvantage is the battery power. With the best in the world, the charge only lasts around an hour at the most and it takes time to re-charge. So you do have to remember to plug them in to re-charge (that hotel bedroom problem again) unless you have a USB version. However, technology is advancing and those same portable chargers used with iphones can be used with a portable hair straightener (that has the right usb connection). We evaluated the best options available and included a full review of each choice. You can always count on BaByliss to develop a high quality hair tool and this one is no exception. It comes with two BaByliss replacement energy cells for extra charge when you need it – making it one of the longest charging portable cordless hair straightener (as long as you keep one of the cells continuously at a full-charge) as it gives you more flexibility. It also has its own heat shield so you can store it away while you’re traveling. 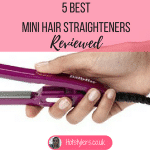 The straightener heats up very quickly, within a couple of minutes and it can achieve up to 200 Deg C. Made out of ceramic, it delivers good heat, well conducted so there should be no hot spots; the downside is they won’t achieve a quality finish on thick hair. What we like about this one is the material. It’s ceramic so conducts heat just as well as a regular straightener. It’s a good bet for portable cordless straighteners. It is small though, so if you have very long or very thick hair it probably won’t be the product for you, but for short hair and fine hair, it’s a good travel product. The technology behind the Obest means it’s able to recharge by USB and the battery lasts 20 minutes when used continuously (so you do need to recharge it regularly unless you carry a portable charger for your phone). The ceramic plates also blend with tourmaline making these plates even better for making hair look straight and sleek. The tool is ionic, so it removes frizz and flyaway and your hair looks smooth and shiny. Additionally, the Obest boasts adjustable hair temperature (so you can use the right one for your hair type) and it’s so small, it slips into a handbag (just 7.2”). This cordless straightener works as a curling hair tool as well as a straightener, giving you the best of both worlds and unique portability. With tourmaline and ceramic material, this one is great for removing frizz and flyaway and it’s comfortable to use, with an easy-grip. The downside is it only retains heat for 15 minutes once it’s removed from its base but the base is so quick to re-charge, it’s convenient. Another small cordless straightener, it’s probably not for you if your hair is very thick or very long. This cordless hair straightener is slightly larger, at 8” (although still not ideal for very thick or very long hair). However, they will still slip into a reasonably sized handbag and they’re good for travel. These straighteners come with an emergency charger for mobile phones and a safety lock. Additionally, the Huachi’s auto-shuts off after half an hour although they probably wouldn’t over heat as they’re running on a rechargeable lithium battery. Offering three heat settings, they’re useful for most hair types and the battery life is around half an hour used continuously. They do heat up very quickly so they’re great in a hurry; expect to be able to use them within just 30 seconds of switching on! The Carmen represents a premium option. This straightener is heavier and and feels very solid. It also includes Keratin Protech plates that deliver extra shine, three temperature settings giving you good temperature choice, and the rechargeable lithium battery. The battery delivers 25 minutes of continuous heat with one full charge. Additionally, the Carmen Samantha gives you three years manufacturer’s guarantee so that means you have extra peace of mind. The travel pouch gives extra protection when you’re taking these out with you or traveling with them. They’re also the best bet for thicker hair as they’re a more generous size. The newest Obest cordless straighteners deliver more advanced features. They still have the ceramic tourmaline plates but these come with advanced infrared heat technology to give your hair extra protection and ensure even heat distribution. They also straighten hair faster; delivering silky-smooth hair is extra-quick time. Heat-up is quick, right up to almost 400 Deg F and there are three heat settings for your convenience. The 8.2” straighteners come with a locking button so they don’t accidentally turn on while inside your bag and they also shut-off after a half an hour of idle use. Charging comes through a USB port so they can charge all round the world. Suitable for fine, short hair or shoulder-length mid-thickness hair, we wouldn’t advise these for very long or very thick hair. Charging time is 3 hours, and when fully charged, you get half an hour of continuous heat.